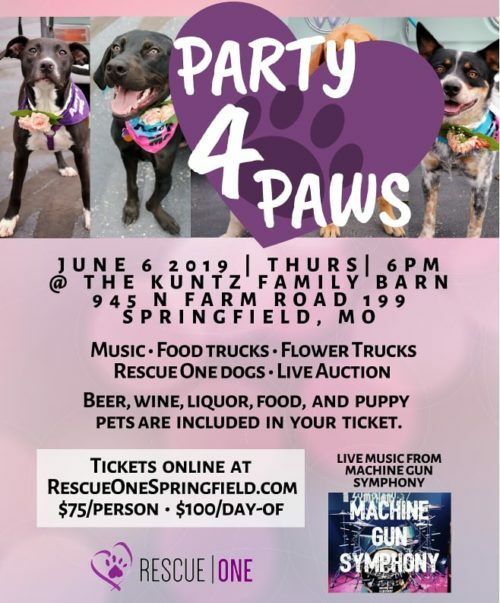 Join us for the summer party of the year, Party 4 Paws! There will be music, food trucks, beer, wine, specialty drinks, live auction, LIVE MUSIC by Machine Gun Symphony and guaranteed fun! Tickets are $75 in advance, $100 the night of the event. *All food and drinks included with your ticket. All proceeds benefit Rescue One! Click on the teal colored lettering below to choose the option you would like for number of attendees then add to cart. You will have the opportunity to change the number of tickets you want in the checkout screen (example: you can change from 1 ticket to 3 tickets). At checkout you can pay through Paypal using a paypal account OR you can check out without a Paypal account using a credit or debit card.